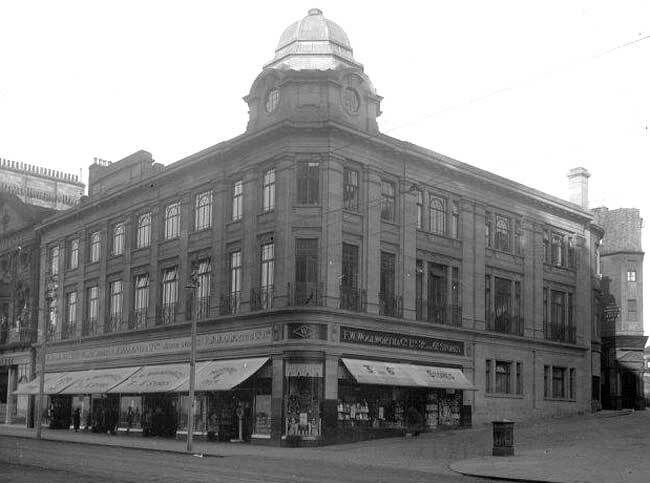 Woolworths opened their FOURTH Glasgow store on Sauchiehall Street, backing onto Renfrew Street in 1927. [The other Glasgow stores were Store 39 at Union Street, Store 118 at Argyle Street and Store 121 at Charing Cross Mansions.] They had acquired the Wellington Arcade on Sauchiehall Street, which was a continuation of a small shopping arcade called the Queens Arcade that was built in the mid-19th century. Woolworths demolished the Wellington Arcade to build their store. Below you can see the M&S next door and why Woolworths wanted a grand facade. This is the back of the store on Renfrew Street. According to The Telegraph, the store was pictured in 1951 as a horse-drawn cart containing supplies pulls up outside. I can’t quite believe that’s how supplies were delivered in the 1950s! Here is another photo of the back, from the style of the cars this would be late 1950s/60s? The store closed in January 1984, and went through some redevelopment recently. The building is new but kept in a similar style of the old Woolworths, and is now a souvenir shop called I Love Glasgow. Woolworths opened in Coatbridge in Scotland in 1927. I can’t find any early photos of the store, but the frontage in this photo looks 1950s, so there must have been a makeover around then. James Kelman was Pat’s assistant manager between August 1995 and July 1996. He remembers moving all the kids wear from the back of store to stop it getting stolen. Former employee Nicola Clarke says the staff nights out were fab. She worked there from 2004 right until the end and was one of the last to have a Woolies baby, being four months pregnant when they closed. She wonders if the drains behind the old entertainment counter still flood in bad weather! Here’s a staff photo she has kindly shared. And she has shared a photo of what must be the basement level – look at that vintage floor tiling. Woolworths in Coatbridge closed in January 2009, and it stayed with the signage still there for a good few years. The business that later occupied the building painted a ‘NOT’ on the fascia and called themselves ‘Not Woolworths’. They sold beds and random screws and fittings apparently. They left, and the building has lay empty ever since. I think somebody bought the building at auction and replastered the front so it looks better, and now they are just looking for a business to lease it. Note on the right side, the original Woolworths doors from the 1950s are still there. Woolworths opened in Dumfries, Scotland, in 1926. You can see the store on the right of this photo – the white building. The store was all on the ground floor, with the stock room being upstairs. There was also a side entrance. The store closed when the chain went bust in December 2008. The store is now an Iceland. If you are ever in Dumfries and passing Iceland, now you will know that this store was a Woolworths. Woolworths opened in the Scottish town of Inverness on 11th September 1926. They had bought the premises from the Portree Wool Company and built their store here. In 1964, the store was ‘reskinned’ to give it a more ‘modern’ appearance. It certainly contrasted with the surrounding historic buildings. Molly Dawson worked at Inverness store from 1975 right until the end (33 years in total). She has kindly shared her memories of the store, as well as some of the photos featured in this post. “233 Inverness was on the High Street and was a pretty large store, with two salesfloors and two stockrooms. There was a further floor above, where there were chillers and hooks on the ceiling from when the store had its own butcher. It used to sell groceries – fruit and veg, meats, cheeses and also broken biscuits. The store had a lot of staff who worked 30+ years in the store. When I started I remember hearing stories of how there were basements where stock was stored. There were hatches behind the counters where staff could nip down and get stock. At some point a floor was put down and the flats above we’re converted to stockrooms. The store also had an escalator installed. In its day this was a novelty, as it was probably the first in the town. My mam said my granny loved going in to get a wee go on the escalator. Over the years there were several refits and the store looked fantastic after the 10/10 upgrade. I can remember when Princess Di came to town. The town house was opposite. We had police on the roof and had a wee system in place whereby everyone got a chance to see her on the High Street. With our area manager (Terry Kelly) seeing the faces at windows on reporting Scotland. Our ground floor was on a slant. When the weather was bad there was a drain which used to turn into a fountain. We’d have to battle to stop rain running into the escalator – happy days! We always had fab parties. Some in store. Always trying to keep an eye on the young ones… they were always smarter than us. Many couples got together there, and lots of life-long friends made and still going strong. I have fabulous, happy memories of a non-related family. The second Woolworths to open in Aberdeen was a 3-storey superstore on Union Street that opened in 1926. The first was Store 79 on St Nicholas Street. This bigger Woolworths was not in a purpose-built store, and there is some interesting architecture with the arched windows. Here in the 1970s you can see the change in fascia. Ann Baxter worked for over 35 years in Woolworths. She says “The staff were like a second family and I still meet up with some of them. I still miss Woolworths.” The Shand twins were supervisors, and ran the store as the story goes, back in the 1980s. Colin Higgins remembers there being many regional meetings at the Aberdeen store as 228 was one of the “jewels in the regional crown”, and they wanted colleagues from South of the border to see it. Was this facelift a failure? If this store was the most profitable in the country in 1985, why did it close just 5 years later, in June 1990? Well, that is what happened. Today you will find Shoe Zone and McDonalds where the Woolworths store was. Woolworths opened in Montrose, Scotland, in 1926. It was an odd-looking building as it seems they demolished part of a terrace and built a single-storey store that didn’t match its neighbours. Woolworths traded from this location for over 80 years. Former employee Heather Murray kindly sent me a photo with the team in front – the uniform looks so bright and cheerful! The store traded until the end, closing after the chain went bust in December 2008. In this photo from after closure, you can see it was a small store. You can see the peppermint-blue fixtures inside, and the frames in the windows for window POS. It became an Original Factory Shop, which it still is today. It is recognisably a former Woolworths by the tiles on the side pillars and the shape of the entrance and windows. In 1925, Woolworths built their Scottish flagship store on the busy and bustling Princes Street, opening its doors in March 1926. It was the second store in Edinburgh after the first one in Leith, but this one was much grander. Here is it in 1933. Its location next to the Royal British Hotel and Palace Cinema, and opposite the infamous Waverley Steps made it a national landmark. 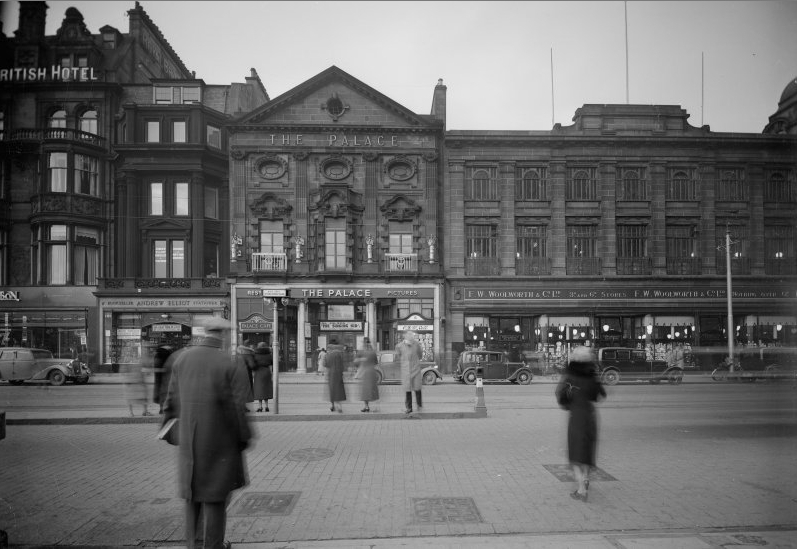 In 1956 they expanded into the cinema next door, demolishing it and extending their external facade and adding a floor in the roof. The F.W.Woolworth fascia was updated to extend the whole way across. Here it is in the 1980s shortly before closing, with it’s updated logo. 1984 they closed down when Kingfisher took over and closed most of their large Woolworth stores. 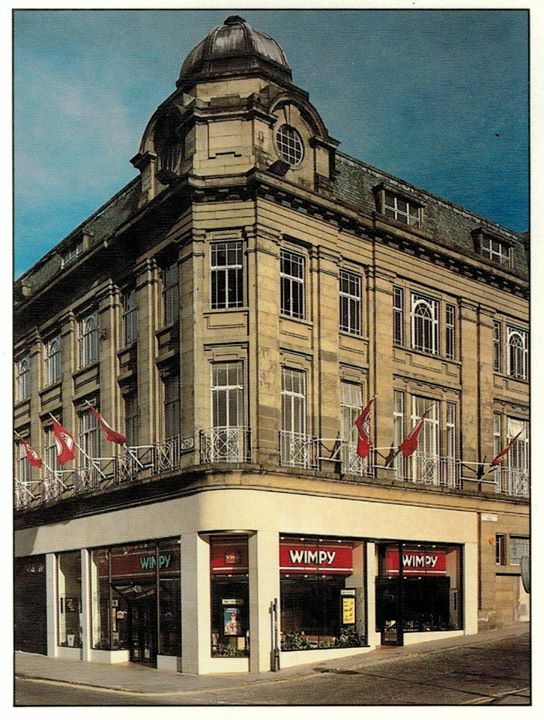 A Wimpy soon opened in its place, here it is in 1986. 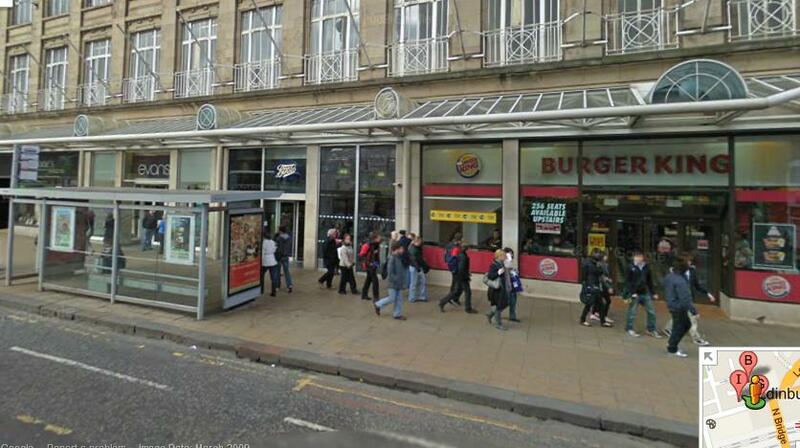 In the 1990s the Wimpy became a Burger King. Here is the parade of shops in 2009, with Boots, Evans and Waterstones. All the shops left and the building was empty for a number of years. Then in 2011, Apple started a $20 million reconstruction of the whole building, with the insides totally changed but keeping the grand exterior facade as it was – as fortunately this is a listed building. 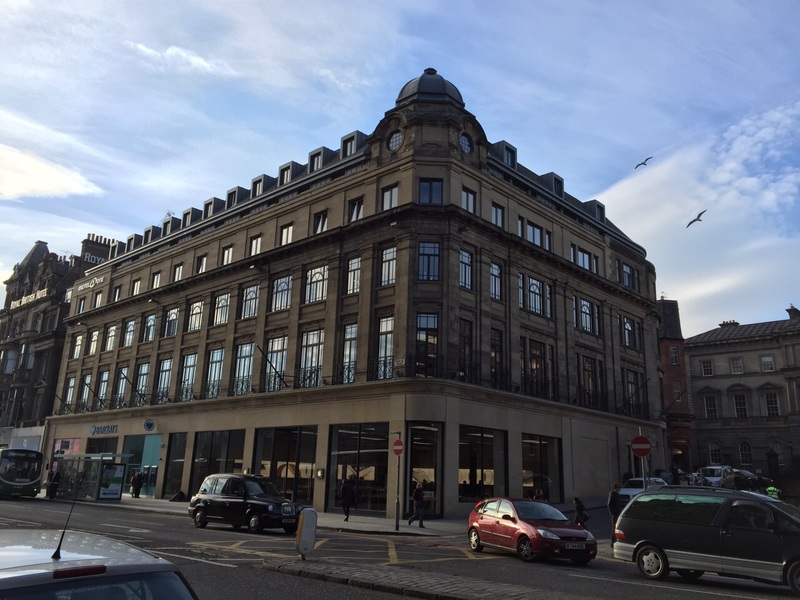 This is a photo taken by my brother in March 2015 – we can see it is an Apple Store and a Barclays, and the Royal British Hotel is still there. The Apple branding is very subtle, and the interior is completely open – quite different from it’s Woolworths day, yet the exterior is keeping its heritage. Good work Apple. This post was originally written in 2015. 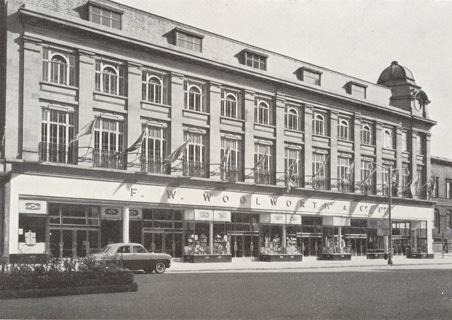 Woolworths opened in Ayr in 1926 on the site of the old King’s Arms Hotel, which was demolished to build the new store. Presumably there was an Art Deco facade, and in the 1950s there was probably a makeover so that it looked more like the store in the below photo. Unfortunately I cannot find any photos of the store when it was actually open, but I do have a memory from former employee Kevin Alexander. He remembers working with Ken Wilkinson, Tom Reilly and John Savil in the 70s. “Tom decided he wanted to move habby from the wall on the way up to the canteen to the left wall shopping with pictures. We used to display them on Huntley brackets on flat bars. It took me all of Wednesday afternoon’s half day closing. Tom rolls in at about 6pm with a dart board – he had taken up darts and wanted to practice, and didn’t want to be seen from main road.” Cheeky! This Woolworths closed around 2007 and they moved to the other end of the High Street at numbers 127 – 137 High Street with a new store number of 1266. 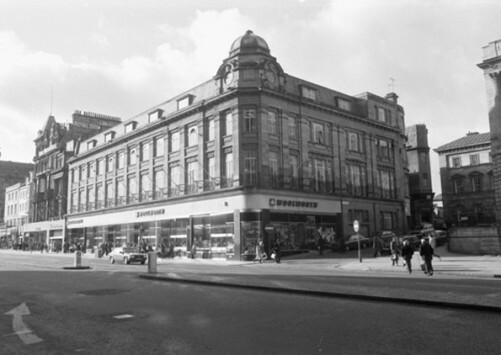 The old Woolworths along with the neighbouring stores had been acquired for redevelopment – see the below photo. The old Woolworths store is to the left. The plans are to transform this area to a modern riverside block (the River Ayr runs behind these buildings). The building have now been demolished and archaeologists have found the remains of the old King’s Arms Hotel where Woolworths was, along with pieces of medieval pottery and the walls of the pub. If you compare the above photo with the below, you can see that Woolworths was exactly where the Kings Arm Hotel was, as the neighbouring buildings were the same. Woolworths opened in Kilmarnock in 1925, on the corner of King Street and Market Lane. They were at this location until the 1970s, when the buildings on this side of the road were demolished to make the Burns shopping centre. Today WHSmith is at numbers 36 – 40. The new Woolworths store was at numbers 8 – 10 of the same street as part of the new shopping centre, in bigger premises. There was an entrance from King Street and an entrance inside the shopping centre. From the fascia in this photo, we can see it had a 10/10 refurb in the 2000s. The store closed in January 2009. After closure the unit was empty for a while before being split into two units. The unit with the shopping centre entrance is now Home Bargains. The King Street side is New Look. Woolworths opened in Perth, Scotland in September 1925, on the High Street (see on the right of this photo). In 1966 the store was extended and the building reskinned. The new store had a restaurant on the upper floor. A small Salisbury’s store was at the side of the store, but within the same building. May Banach remembers training days at Perth store, and like Scott, she remembers that there were lots of stairs to go up and down. Another Tony, Tony Jenkins, had a Saturday job on the tills around 1994. He remembers it being a great job, working his way up to cash desk supervisor, and having lots of nights out with his colleagues! Now, if you are wondering what Marriane is talking about, “Feelings” was a customer service incentive scheme in the mid-80s, based around the concept of giving customers a ‘warm fuzzy’ feeling and not a ‘cold prickly’ feeling. There’s a whole article about the scheme, if you fancy reading more about it. Perth Woolworths closed in December 2008 when the chain went bust. After the store closed, it lay empty for quite a few years. There were plans to demolish the building and create a new street connecting the High Street with the Concert Hall. But lucky for us Woolworths fans, the building remains and it is now Next and New Look. The 180th Woolworths store opened in Leith in 1925. It took over the Queen’s Hotel, and the architecture was kept as it was. The statue of Queen Victoria, located in front of the store, was erected in 1907. It was the result of a meeting at the hotel. In this photo you can just make out the 1970s lettering of Woolworth in the background, and you can see the recognisable Woolworths doors and mosaic pillars. Marianne Ellis was the store manager for a couple of years. She remembers that the stockroom still had a staircase and stained glass window from the Queen’s Hotel. She says “I believe the stockroom was haunted. Kay and I were working in the stationery aisle and photo albums decided to fall out of the bins!! The entertainment stockroom was the old butchery prep area and the old cold storage fridge. Another employee, Scott Barber, says the ghost was called Mary the stockroom ghost, and Wilma Johnson describes the building as a “very creepy but very interesting building as well”. The store had a 10/10 refit, and you can see the change of fascia in this photo. There was another entrance to the store – it was an L-shaped store that backed on to New Kirkgate (pictured below on the left). After Woolworths closed in December 2008, the store was split into two units. The front side became a British Heart Foundation shop. The New Kirkgate side became Poundland. And Queen Victoria still stands proud at the front. Woolworths opened in Dundee up in Scotland in November 1924. Initial plans were to face this building in cream-coloured terracotta but the plans were abandoned. In the 1939 the building was updated to become a three-storey one with a faience front. “I can remember Woolies in the 60s when they still had the original old wooden counters, but around the beginning of the 70s the store was modernised and got itself some new open plan style rack shelving. One of the relics from the old store they kept going, however, was the huge weighing machine tucked away in the corner beside the photo booth. A big red & silver thing it was, a penny a go. Another memory from the 70s I always associate with Woolies were the budget priced “Top Of The Pops” albums with glamour girls on the LP covers. 12 chart hits for 60p or something. For that price though you didn’t get the original artists, oh no, these were 2nd rate rogues imitating our favourite pop groups. The work of session musicians in fact, and they were mince! “‘We’ll cut through Woolies,’ was a welcome statement by my mum, coming at the end of a joyless eternity of staring at rolls of fabric in Smith and Horner’s. The store closed in March 1984 and John Menzies moved in. They were bought by WHSmith in 1998 and I assume that is when this store closed and became a Tesco on the ground floor with JJB Sports on the upper floors. Today Tesco Metro operates from this building, but if you look up you can see the 1930s Woolworths architecture. The JJB Sports floors are To Let in this photo, but today Intersports trades from here. Woolworths opened on Paisley High Street in Scotland in 1924. Again I have no early photos of the store, just this one where we can gather there was a store makeover in 1969, with the oversized ‘Woolworth’ letters experiment on the fascia. According to a local Facebook group, the tallest man in Paisley (who was 7ft tall) was working here as a store detective until the store closed in 1988. After Paisley Woolworths closed, the unit was subdivided and became a WHSmith and an Etam store. Etam stores closed down nationwide and now that unit is Sports Direct. In 1977 the Thistles Shopping Centre opened and Woolworths moved into there. The Port Street building is now occupied by a Bank of Scotland branch. The store inside the Thistles shopping centre kept the store number 166. This was what Woolworths looked like inside. It closed in December 2008. Today H&M is in it’s place. Woolworths opened in Hamilton in 1923, originally on Quarry Street. In 1965 a new shopping centre was built and Woolworths moved here. This was where they stayed until the chain closed in December 2008. From this photo you can see there was a blue fascia up, which means this was a 10/10 trial store. Today Wilkos is in its place. The 145th Woolworths store opened in Kirkcaldy in Scotland. There are no photos of it on the internet at all, but we can guess from the photo of the building today, that it had a makeover in the 1950s/60s, being extended to become a huge store. The store closed down on 28th June 1986. In the 1990, a Woolworths Music and Video store opened at 148 High Street (Store 1168) and then in the late 1990s, a traditional Woolworths returned to Kirkcaldy at the Mercat Shopping Centre on the High Street (Store 1201). Today the building of the original store at 234 – 242 High Street houses the Kirkcaldy Indoor Market, which gives an idea of the size of the Woolworths store that was. The Woolworths does are still in use after all these years. And what is exciting is that an original mosaic Woolworths floor still exists in front of the fire doors at the far right of the building. If you do have any photos of any of the Kirkcaldy Woolworths store, please do send them in, it would be great to see how they looked. We’re in Scotland again! Store 124 was on the medieval High Street of Dunfermline, Fife, and it opened in 1922. Source: Dunfermline Through Time – Simpson E., Robertson G.
In the 1939 they moved across the road and built a new store with an Art Deco facade, contrasting with the French Gothic neighbouring buildings. The store was the one that drew the crowds on this High Street. This Woolworths closed in 1984, and today it is a Poundstretcher. And if you are ever shopping on Dunfermline High Street, do take a look above Poundstretcher. Though it looks like the windows have been covered up, you can still see the remains of the Woolworths Art Deco facade. In the 1930s the store had an Art Deco update to its look. The fact that this was allowed shows the clout that Woolworths had in such towns with historic buildings. There were updates to the fascia through the years. It was branded a Woolworths ‘Local’ store until its last days in December 2008. And today it is a Wetherspoons pub, the Art Deco facade is still there and you can sit and have a drink in this old Woolworths. Woolworths opened their third Glasgow store in 1922. The first store was on Union Street (Store 39) and the second on Argyle Street (Store 118), which also opened in 1922. This store was on the Charing Cross side of Glasgow, backing on to Renfrew Street. It wasn’t a purpose-built building, they opened in the existing Charing Cross Mansions. The below photo shows a sweet scene, it looks like a father and son looking through the shop window. The store traded from this location for about 50 years before closing in the early 1970s. Very recently, some original signage was revealed at Renfrew Street (the back of the store) – and it is still there today. It’s literally at the end of Renfrew Street where it becomes Buccleuch Street. You can see it on Google Streetview, but why don’t you go to Glasgow and take a look at it!! Going by Streetview and comparing with the 1930s photos above, the building the housed the front of Woolworths still exists and today it is two units – a traditional toy shop (very appropriate) called The Big Top and a cafe called Tinderbox. Woolworths opened their second Glasgow store on Argyle Street in 1922. The first opened in Union Street 8 years earlier. The same year (1922) a third Glasgow branch opened in Charing Cross. The design of the Argyle Street store was the opposite of reserved, almost a ‘look at me’ store. Unusually the fascia has the “NOTHING IN THESE STORES OVER 6D” in the centre. “WOOLWORTHS STORES” also appears in a semi-circle above the parapet wall. The adaptations were agreed with the landlord, replacing signs from a previous occupant. In 1960 there was a huge fire. This photo was taken in 1963 of the new rebuilt store, it does have a sixties Woolworths style to it. This store closed, the date is unknown. And today it is TK Maxx, where you can see the windows have changed but other than that, it looks the same. In 1994 Woolworths opened in another location on Argyle Street. It would have been a very large, L-shaped store. Today it is Poundland – this photo is a crossover one in 2011, where Poundland has opened but the Woolworths signage is still up.